Bookmap is an innovative trading platform that displays the entire market liquidity and the order flow. It provides clear visualization of the past and present state of the order book utilizing an adjustable heatmap. Bookmap provides full transparency of the actions and intentions of market participants. Traders view the liquidity in the market as an HD video with no delay or aggregation. Bookmap provides advanced Education for traders, including Order flow Course and live trading webinars with professional traders and educators. Bookmap FREE Digital package allows connection and real-time trading in cryptocurrencies. 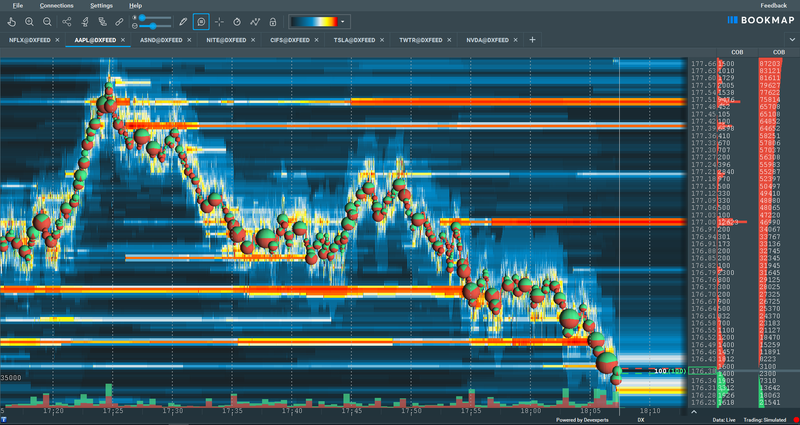 Explore the heatmap, data speed and also connect to delayed data of US stocks powered by dxFeed. All for free! When you are ready to start using real-time Futures or US stocks, upgrade to Bookmap Global/ Global+ packages. As of Nov, 2018 prices for Global is $49/mo and for Global+ $99/mo. Discounts apply to yearly subscriptions or through eligible brokers.